I’m so excited, yet again! These are all one-of-a-kind bracelets. They each have a blend of colors and shades to make it a little more interesting and fun. Some of them even have different sized beads that gives them texture. I love how these look and I know you will too! 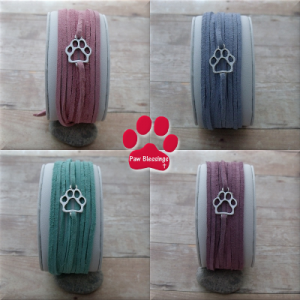 Wear this bracelet to celebrate and honor your fur baby. If you’re a lover of all things paws, this is for YOU too! 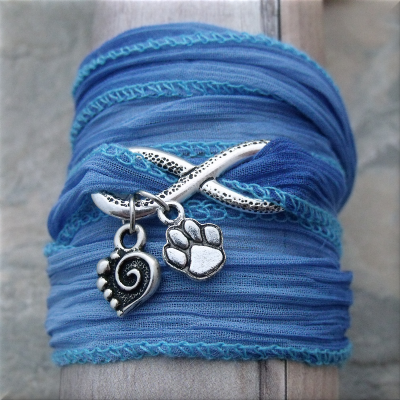 Show the world you love paws! Blue, White, Turquoise and Lilac are just waiting to be wrapped around your wrist, making you happy every day. Look at that cute puffy paw print! It just dances around on your wrist with every move. You can wear these bracelets alone or stacked. 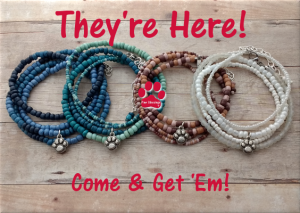 They’re so easy to put on…just wrap and clasp! Keep your fur baby close to your heart all day! Tell me what you think below! I’d love to hear from you!